E' di nuovo tra noi uno dei capolavori di Eugene Chadbourne, lo storico There'll Be No Tears Tonight (1980). Un'idea di Corbett vs. Dempsey, pienamente sottoscritta dal titolare, che vi aggiunge appropriatamente una buona mezzora di altri massacri. Dolcetto e scherzetto! 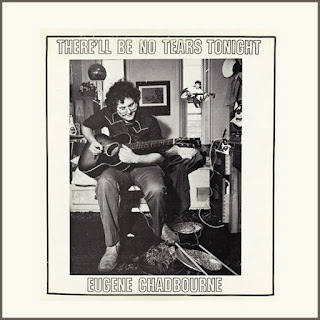 One of the absolute essentials of Chadbourne's oeuvre, what he described as "free improvised country & western bebop," featuring his frantic, skewed interpretations of classic songs such as Merle Haggard's "Swingin' Doors," Roger Miller's "The Last Word in Lonesome is Me," and Willie Nelson's "Mr. Record Man," There'll Be No Tears Tonight was recorded in Spring of 1980. Its lineup includes Chadbourne on acoustic and electric guitar and voice, Tom Cora on cello, John Zorn on saxophones, clarinet, and birdcalls, David Licht on percussion, with another set of songs featuring Doctor Chad on electric dobro and singing, with Scott Manring on lap steel and lap dobro, Robbie Link on acoustic bass, Dennis Licht on percussion, and David Licht on drum set. For the guitarist's solo Johnny Paycheck medley alone, this would be worth the price of admission, but the whole show is built on lightning fast juxtaposition and hilarious interjection. Though it was reissued on CD, it's been out of print for years, and here is given the royal treatment, with facsimile repro cover, new photos from the sessions, remastered from original tapes, and an additional 26-minute track titled "Richmond Dobro Massacre." In this deluxe reissue, Tears remains one of the best free song outings ever made and is an absolute must for every home. Un agile ripasso delle pubblicazioni Cuneiform dell'anno in corso è pronto per essere consultato - gratuitamente, se così si vuole - alla pagina Bandcamp dell'etichetta: "This special Name Your Price compilation album features nearly 1.5 hours of creative and fun music over the course of 15 tracks all of which was released by Cuneiform Records in 2016. 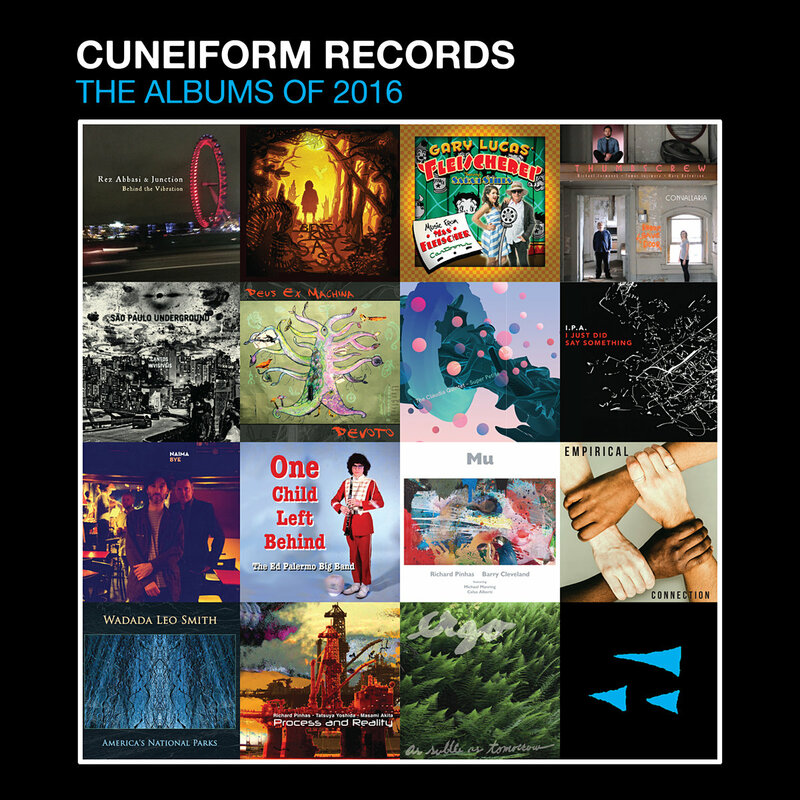 We invite you to listen to 'Cuneiform Records: The Albums of 2016.' We're honored to have worked with and released albums by some of the best musicians in the world in 2016." Bob Drake, Bing Selfish, Steve MacLean, Alan Jenkins, Fred Frith Trio, Ossatura, Jump for Joy!, una messe di Avram e Dumitrescu, dvd, nuovi libri, antichi vinili e un imperdibile box antologico di ZnR in sottoscrizione... Sono molti i bei titoli tra le proposte di ReR Megacorp nell'aggiornamento di ottobre 2016 al catalogo di materiali propri e in distribuzione. Con un'amara avvertenza: "Apologies in advance for the price of new US imports, but the democratic will of 1.8% of the British people, abetted by the chancers and fantasists who run the country, has decreed that we shall leave the European Union, with the result that investors, seeing the way the wind is blowing, have been dumping sterling on the open market ever since with the knock-on result that the price of the dollar has risen 15% since the vote. This means if we sold us imports at the old price we’d now be losing money on them. So we have to raise our prices. Unhappily, the same is likely soon to apply to the euro. We’ll hold our old stock at old prices as long we can, and keep rises we can’t avoid as low as possible." Un gruzzolo di brani mai sentiti e alcuni in versione di prova fissati su nastro in vista del secondo lavoro, Goodbye & Hello, epoca 1967. 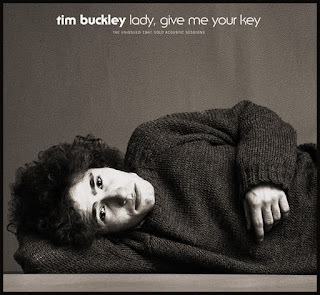 Offre non pochi tesori agli appassionati di Tim Buckley l'album Lady, Give Me Your Key compilato da Future Days Recordings per Light in the Attic, non ultimo il libretto con interviste, pensieri e annotazioni del paroliere e del produttore di allora, Larry Beckett e Jerry Yester. In 1967, the face of rock was changing. In that year alone there were debut albums from The Velvet Underground, The Doors, and Pink Floyd, to name a few. The Beatles had combined orchestration with their music—the result was Sgt. Peppers in June, the same month that Tim Buckley recorded Goodbye & Hello. Buckley was no longer just another singer-songwriter with an acoustic guitar; he was drenched in acid-folk tinges of harpsichord and harmonium. Lyricist Larry Beckett embellished Tim’s songs with introspective lyrics at times, worldly views at others. It was the first major triumph for Tim as an album artist, partially because there were a remarkable amount of pre-production demos that led to it. 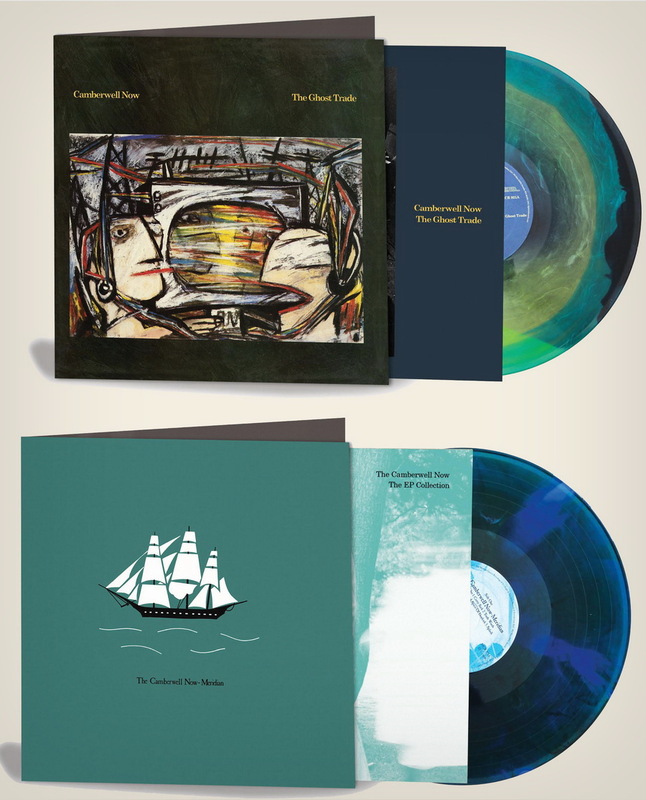 Available here for the first time are these newly discovered master tapes, recorded by Goodbye & Hello’s producer Jerry Yester, along with an ultra-rare acetate, found to be in co-songwriter (and best friend) Beckett’s possession. This is the first-ever posthumous release that reveals a wealth of previously unreleased and unheard tracks from Tim at the peak of his career. 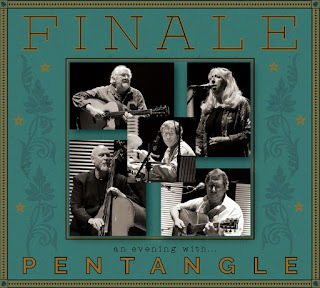 L'ultimo saluto all'affezionato pubblico i Pentangle lo affidarono al tour di concerti del 2008, ricomponendo la formazione delle origini: Danny Thompson, Terry Cox, Jacqui McShee, John Renbourn e Bert Jansch. 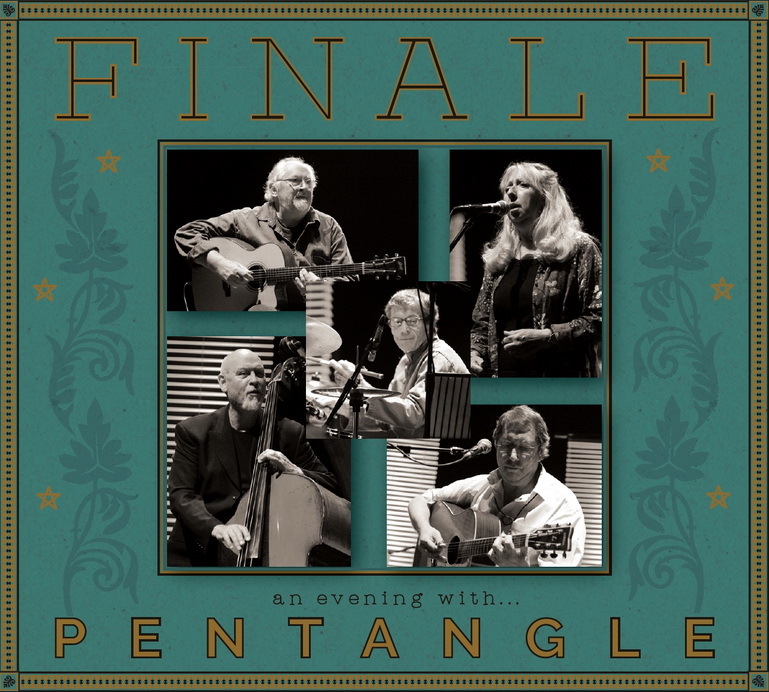 Da lì proviene l'album ora pubblicato da Topic Records, Finale, che inevitabilmente vale a ricordare le successive perdite di Jansch nel 2011 e quella più recente, a marzo dell'anno scorso, di Renbourn. A quest'ultimo è stato dedicato poche settimane fa un importante concerto commemorativo presso la londinese Cecil Sharp House, illustre sede dell'English Folk Dance and Song Society. Un nuovo album (Lodestar) pronto a giorni per Domino a quasi quarant'anni dal suo ultimo, alcune imminenti apparizioni pubbliche legate all'evento, concerti annunciati per il nuovo anno, video promozionali su YT e ovunque sul web, un secondo libro autobiografico (All in the Downs) in via di pubblicazione per Strange Attractor, un film sulla sua vita (The Ballad of) ormai quasi completato: è tornata Shirley Collins! Before illness stole her voice in the early 1970s, Shirley Collins was the queen of the English folk revival. 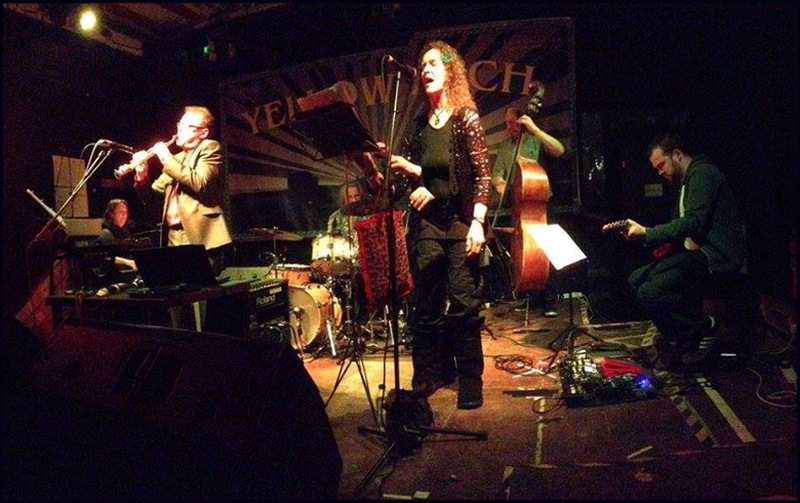 Recent years have seen her records rediscovered by a new generation, while she has become a writer and lecturer (and MBE). 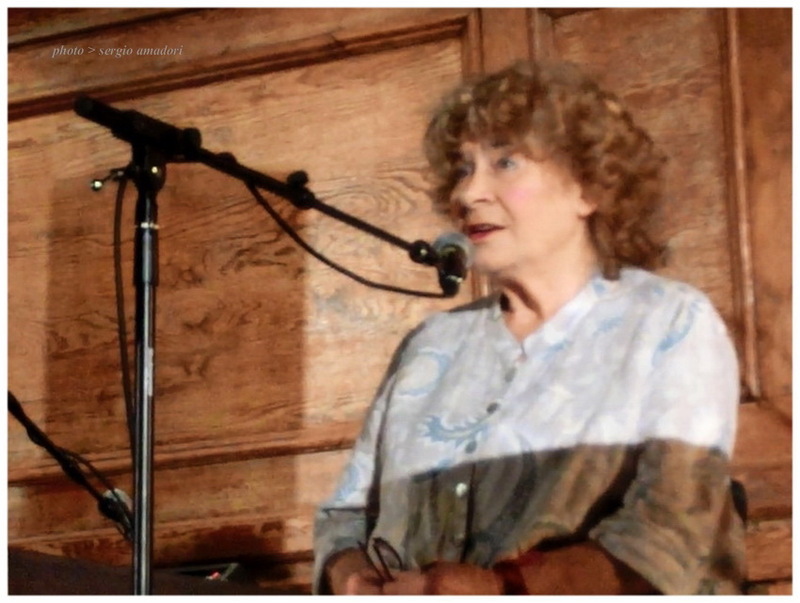 Her return to singing at 81 comes as both a surprise and a delight. The larkish voice of youth is gone, but Collins, who distrusts singers getting in the way of a song, brings gravitas and gentility to a dozen traditional airs (and the Louisiana song Sur le borde de l’eau). The mood is austere, studded by encounters with mortality, but the accompaniments from Oysterband’s Ian Kearey are full of subtlety and surprise, with delicate guitars and blasts of squeezebox. A late-flowering triumph. Anni fa ne esisteva un'edizione in cd per il solo mercato giapponese, ora torna a circolare più diffusamente grazie a Bamboo il primo album di Annette Peacock con Paul Bley, Dual Unity (Freedom, 1972): contiene quattro estratti dai rocamboleschi concerti compiuti dal duo al debutto in Europa nel 1970, nell'epoca pionieristica dell'avvento del sintetizzatore Moog, con l'apporto di Han Bennink, Mario Pavone e Laurence Cook. 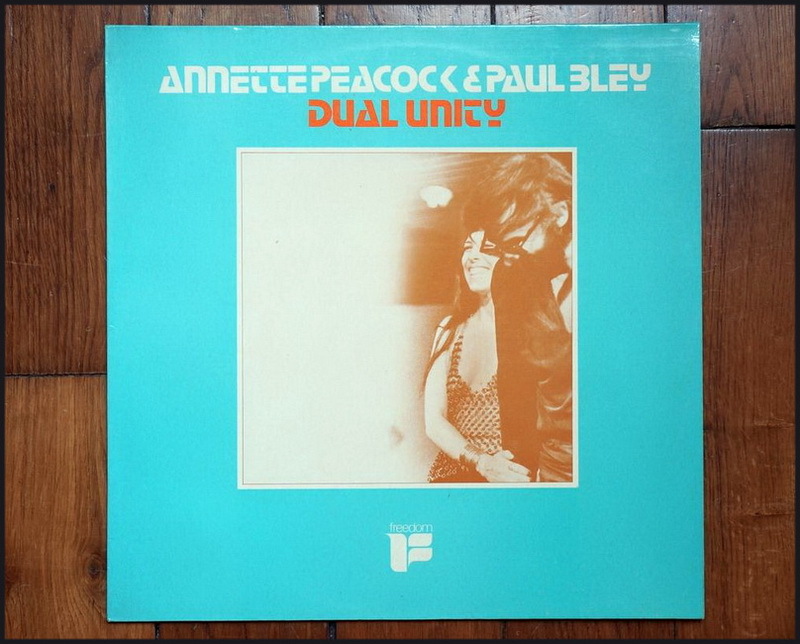 Bamboo present a reissue of the debut album by Annette Peacock & Paul Bley, Dual Unity, originally released in 1972 as a statement of immensity through synthetic minimalism, and a milestone in the avant-garde, free jazz movement. Annette Peacock's legacy may only just be courting recognition proper with the recent retrospective release of her solo debut I'm The One (1972). 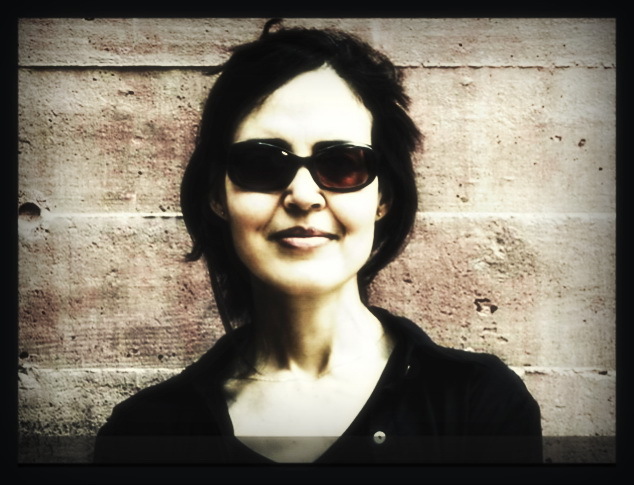 Hailed as a pioneer and artistic genius by many, her debut album and predecessor to I'm The One captures Peacock in her element alongside husband, Canadian jazz genius Paul Bley. Dual Unity is a landscape of aural vision captured on tape in 1970 during their first European tour. For 33 minutes and 21 seconds, the listener is absorbed by other spirits. Using Robert Moog's earliest synthesizers, Bley and Peacock apply the strategic use of silence to indicate its reflective nature with captivating results. Now professionally re-mastered original sound recording with expansive liners, interviews and rare archival photos. Lo ha presentato la scorsa settimana lei stessa, Mônica Vasconcelos: Losing My Sight and Learning to Swim è il documentario radiofonico della BBC che racconta della sua progressiva perdita della vista, delle conseguenti inedite sfide poste a livello personale e professionale, dei primi approcci all'uso del bastone per ipovedente, e in generale delle strategie di adattamento di vita e movimento in una città come Londra. Grande rilievo nel programma è dato all'incontro con il compianto scrittore e neurologo Oliver Sacks - quello di Risvegli e L'uomo che scambiò sua moglie per un cappello - del quale è riportato anche qualcuno dei consigli. C'è anche cenno alle attività musicali di Mônica, ovviamente, tra cui il progetto sulle canzoni della resistenza brasiliana che vede coinvolto Robert Wyatt, e le recenti apparizioni dal vivo (una è stata al Vortex londinese proprio qualche sera fa). Il documento è prodotto da Sara Jane Hall, ed è conservato negli archivi podcast di BBC World Service. Singer and broadcaster Mônica Vasconcelos is slowly losing her sight. Originally from Brazil, she now lives in London, a busy city she finds harder and harder to negotiate safely. As her vision gradually fades, she goes in search of people who may show her new possibilities – new ways of being. They are, among others; her brother, who lives with the same eye condition, and who expertly masters the use of a white cane to navigate the city; her godson, Tiago, who takes her hand in the warm waves on the beaches of Brazil, and - in one of the last interviews he gave before his death - the writer and thinker Dr Oliver Sacks. Oliver Sacks was a neurologist who changed the way many people think about so called 'disabilities', and who Monica met in his New York flat. To her surprise, they found themselves discussing ways of approaching the onset of blindness not only with insight, but also with humour - especially at one magical moment when Sacks shared his own collection of canes with her. The canes, he explained, were acquired to help him get around the city, as his own sight fades. Swimming, he tells Monica, is the one place he feels free and in his own skin - try and find your own version of swimming he advises her. Partenza con il botto per la nuova serie di Alterazioni, il programma di concerti della domenica pomeriggio mirabilmente diretta da Massimo Giuntoli presso Villa Litta a Lainate (Mi). 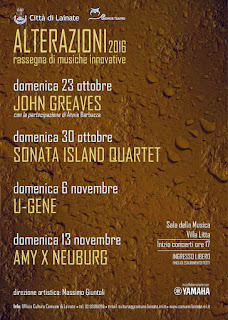 Oggi alle 17.00 c'è John Greaves. 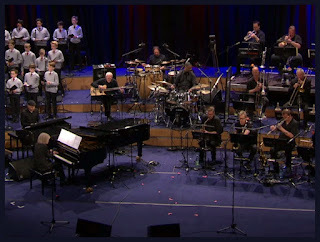 Parte dei festeggiamenti per l'ottantesimo compleanno di Carla Bley si è svolta la scorsa primavera in Germania, ad Amburgo. Da uno degli speciali concerti tenuti ai primi di giugno con la NDR Bigband, con il coro di ragazzi Neuer Knabenchor Hamburg - alle prese con lo studio del francese, come vuole la partitura - e naturalmente con Steve Swallow è tratta la ripresa video ora disponibile al sito della storica band tedesca: La Leçon Française. "Ich wünschte", sagte Carla Bley vor Kurzem, "ich hätte schon in meiner Jugend ein Instrument gelernt. Lange hab ich gedacht, ich würde einfach nur die Noten aufschreiben, die die Musiker dann spielen. Jetzt übe ich täglich, aber ich bin Jahrzehnte hinterher." So richtig zerknirscht aber wirkt sie nicht. "Andererseits falle ich so beim Spielen nicht in die üblichen Klischees, weil ich sie noch nicht kenne." Am 11. Mai feierte sie ihren 80. Geburtstag, da sei ihr die Rückschau auf alte Versäumnisse erlaubt. Zumal, wenn sie so produktiv ins Positive gewendet werden. Eine richtige kleine Jazz-Oper hat Carla Bley rund um das Thema Lernen geschrieben: "La Leçon Française". Sie erzählt von einer englischen Schulklasse (hier von einem Knabenchor verkörpert) im Ringen mit den ungewohnten Herausforderungen der französischen Sprache. 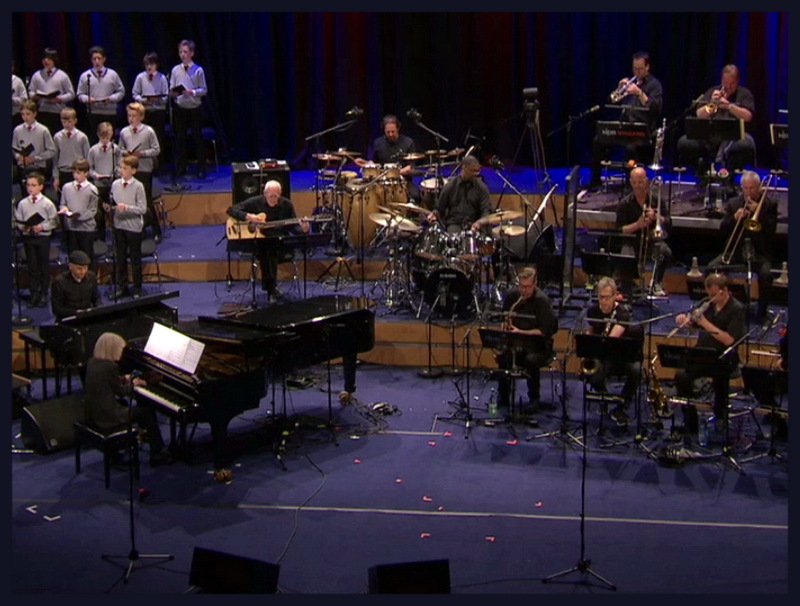 Ihre Welturaufführung erlebte die musikalische Schulstunde 2012 beim Moers Festival, doch wenn Carla Bley ihre Musik jetzt gemeinsam mit der NDR Bigband aufführt, dann darf man sich nicht nur auf eine "zweite Stunde" freuen, sondern auf eine vollständig überarbeitete Neufassung des Stoffs. 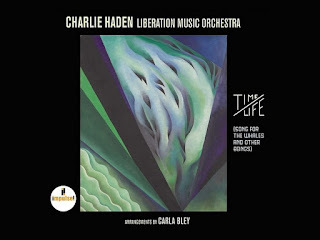 Da pochi giorni è in circolazione un nuovo album della gloriosa Liberation Music Orchestra, l'ultimo a godere almeno in alcuni brani della presenza del suo fondatore e mentore, il compianto Charlie Haden (1937-2014). Si intitola Time/Life: Song for the Whales and Other Beings e lo pubblica la Impulse!, in tempo per aprire la strada alla partecipazione dell'ensemble al London Jazz Festival il mese prossimo, con la guida e gli arrangiamenti della co-fondatrice Carla Bley. Il quinto album insieme di Julie Tippetts e Martin Archer, di nuovo un doppio cd, è ben lontano dall'esser completato, e non vedrà la luce prima del 2017. Sapendoci in ansia, Martin ci concede graziosamente di sbirciare in anteprima uno dei brani, anche se ancora manca la voce di Julie: Headlong. 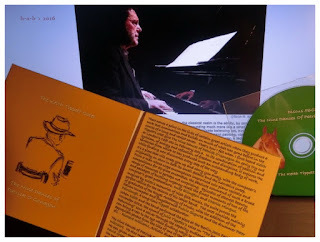 Clifford Allen recensisce per Point of Departure l'album di Keith Tippett con il suo ottetto The Nine Dances of Patrick O’Gonogon (Discus, 2016): "Whatever the ensemble or solo configuration, Keith Tippett has always fascinated. With this octet and the suite of music here, Tippett has created an album that feels like it shouldn’t come to a close. I don’t necessarily mean that The Nine Dances of Patrick O’Gonogon (a made-up character, by the way) are merely open-ended, but that the journey is like a novel or a play that one becomes completely engrossed in and is sad to leave. That almost never happens with a record." Un'ampia rassegna stampa è al sito dell'etichetta. 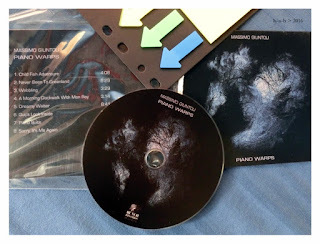 Una ristampa in cd era apparsa nel 1995 per la FMR di Trevor Taylor, ma a quanto pare è questa di Fledg’ling Records la versione autorizzata dallo stesso John Surman di Morning Glory, uno dei suoi primi capolavori come solista in proprio, realizzato con Terje Rypdal, John Taylor, Malcolm Griffiths, Chris Laurence e John Marshall. Originariamente era su Island, nel 1973. Le note di copertina per questa edizione sono di Duncan Heining. 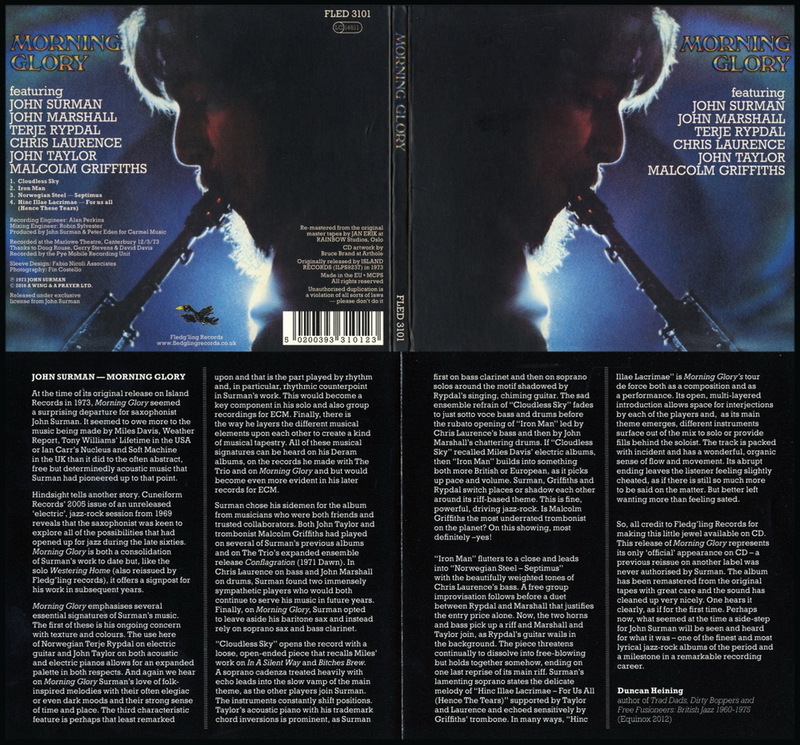 At the time of its original release in 1973, Morning Glory seemed a surprising departure for John Surman. It seemed to owe more to the music being made by Miles Davis, Weather Report and Tony Williams’ Lifetime in the USA or Ian Carr’s Nucleus and Soft Machine in the UK than it did to the often abstract, free but determinedly acoustic music that Surman had pioneered up to that point. Hindsight tells another story. Morning Glory stands as both a consolidation of his work to date and, like the solo Westering Home (also re-issued by Fledg’ling), it offers a signpost for his work in subsequent years. Surman chose his partners for the recording very carefully, drawing from his friends and trusted collaborators. 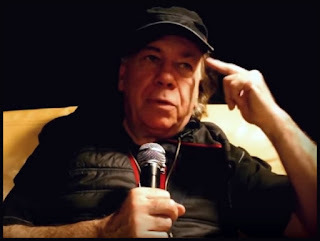 In particular, Terje Rypdal on electric guitar and John Taylor on both acoustic and electric pianos allows for an expanded musical palette. The rhythm section of Malcolm Griffiths on trombone, Chris Laurence on bass and John Marshall’s chattering drums lay down a remarkably elastic rhythmic counterpoint. All of these musical signatures would become even more evident in his later recordings for ECM. Re-mastering from the original master tapes supervised by John Surman. 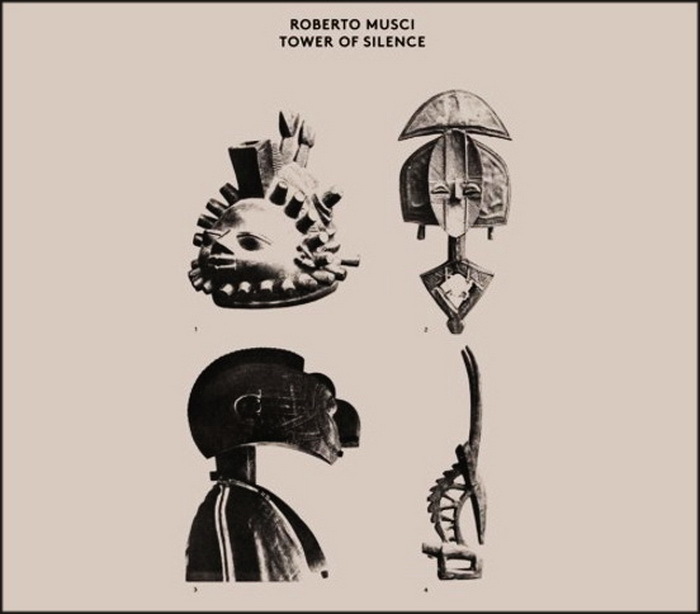 Cuneiform Records saluta la stagione autunnale con quattro nuove produzioni di calibro, suggestive e visionarie: Richard Pinhas e Barry Cleveland, Mu; di nuovo Pinhas con Tatsuya Yoshida e Masami Akita, Process and Reality; São Paulo Underground, Cantos Invisiveis e un nuovo capolavoro di Wadada Leo Smith, il doppio America's National Parks. 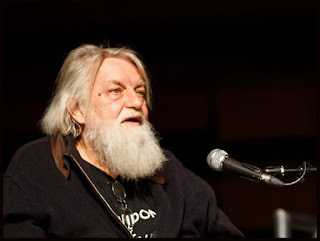 Per la puntata di ottobre di Canterbury Sans Frontières Matthew Watkins riprende brani della conversazione di Robert Wyatt tenuta con Gavin Esler lo scorso aprile all'University of Kent di Canterbury, con gli interventi musicali del gruppo di Annie Whitehead. 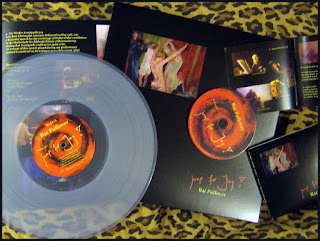 Ma c'è anche molto altro: "Daevid Allen getting all bleak and technoid on his last US tour before disappearing back to Oz for the 80s, the Softs oblique tribute to another TV presenter, Kevin Ayers from a '76 Peel session, Nucleus live on the BBC in '74 and Hatfield live in '75. 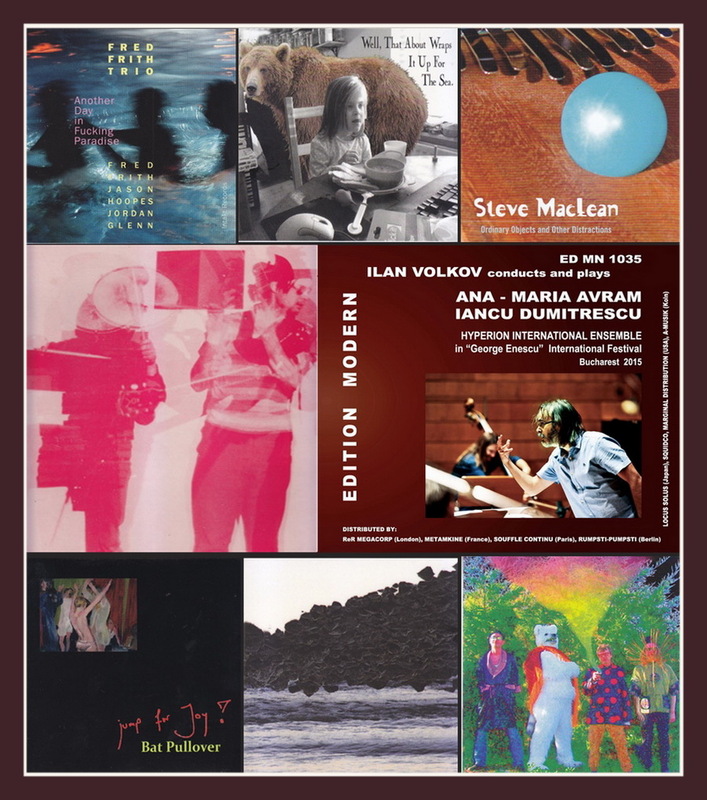 Some William Burroughs cutups, more Aksak Maboul, more neo-Cantuarianism from Amoeba Split, Third Ear Band on French TV and ancient electronica from Suzanne Ciani and Soul Oddity. From the Canterbury of now, a new album side from Lapis Lazuli and Syd Arthur jamming freely for the 2009 Winter Solstice." Nel ricco programma di Radio Revolten, festival di arte radiofonica in corso a Halle (Germania) per l'intero mese di ottobre, è oggi la volta di Chris Cutler, con una performance in studio proposta anche in pubblico domani assieme a quelle di Howlround e Víctor Mazón Gardoqui. 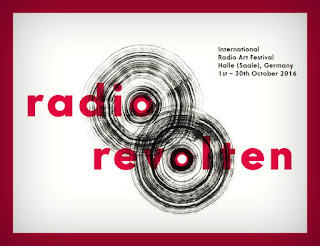 Si può seguire il tutto dalle frequenze radio (FM 99.3 MHz) oppure in streaming in www.radiorevolten.net. 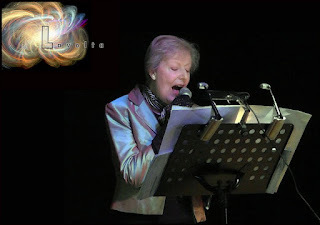 A meno di un anno dal suo debutto in concerto torna in scena l'ensemble cameristico Lavolta, costituitosi nel Devon (Regno Unito) sotto la guida artistica della violinista Emma Weldon allo scopo di diffondere la conoscenza di autori e opere del Novecento anche al di fuori dei circuiti teatrali e musicali delle maggiori città. Ne fanno parte tra gli altri le cantanti Sarah Owen e Kate Westbrook. Due gli appuntamenti più imminenti: questa sera al Quartz Festival di Taunton (Somerset) e venerdì prossimo a Corsham (Wiltshire). Lavolta, a chamber ensemble featuring vocalists Sarah Owen and Kate Westbrook together with an 11-piece band, presents a concert of outlandish and extraordinary pieces of 20th century music. Italian composer Luciano Berio's Folk Songs pays tribute to the artistry of legendary American singer, Cathy Berberian. 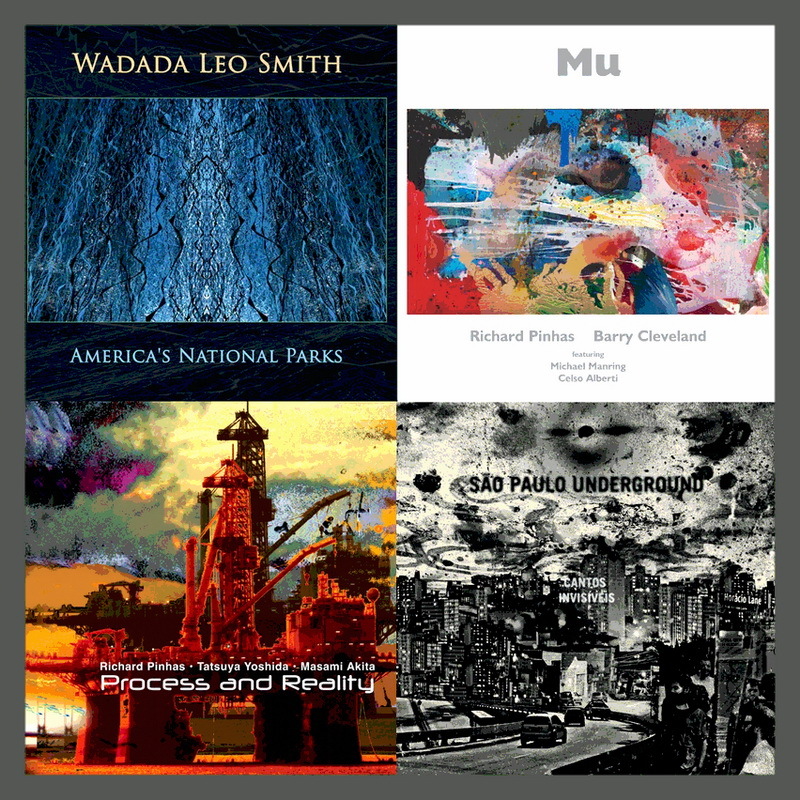 The songs, from the United States, Armenia, France, Sicily, Sardinia, etc., were chosen from old records, printed anthologies, or collected from folk musicians and friends. William Walton’s irresistible Façade 2, also dedicated to Berberian, sets Edith Sitwell’s jaunty poetry within colourful music. Judith Weir is Master of the Queen’s Music, and her Really? is a set of three entertaining stories by J.P. Hebel and The Brothers Grimm for small ensemble and voice. The concert includes more irrepressible music by another Italian composer, Franco Donatoni, the evocative cabaret of Kurt Weill and, from closer to home, Vaughan Williams' settings of poetry by Houseman, Along the Field. 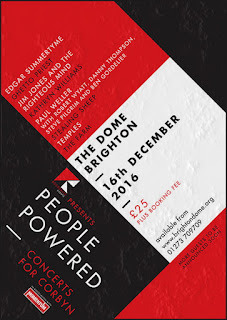 Sono in prevendita a partire da domani i biglietti per lo speciale evento musicale che si terrà a Brighton (Regno Unito) il prossimo 16 dicembre, primo di una nuova serie di azioni di mobilitazione sociale e politica - denominata People Powered - a sostegno del laburista Jeremy Corbyn. La lista di artisti e musicisti che interverranno è in parte già nota, e ha un che di eccezionale: The Farm, Temples, Kathryn Williams, Stealing Sheep, Jim Jones and the Righteous Mind, Edgar “Summertyme” Jones, Ghetto Priest e un quintetto formato da Paul Weller, Robert Wyatt, Danny Thompson, Steve Pilgrim e Ben Gordelier. People Powered brings together some of the country’s most influential musicians in the hope to rebuild and transform Britain to ensure an equal society. Brighton promoters Rocksalts have collaborated with a stellar line-up of artists from across genres and generations to create this unique revue in celebration and solidarity of the progressive policies laid out by Jeremy Corbyn and the growing grass roots movement around them. This will be the first in a series of nationwide concerts in this format, featuring a diverse array of high profile acts, contemporary artists and up and coming performers. A real coup, don’t miss this opportunity to witness a roots reggae revolution with Ghetto Priest, a psychedelic pop happening with Temples, the poignant singer songwriting magic of Kathryn Williams and a rare collaboration between Paul Weller, Robert Wyatt and Danny Thompson. This is a night not to be missed. More acts are to be announced. 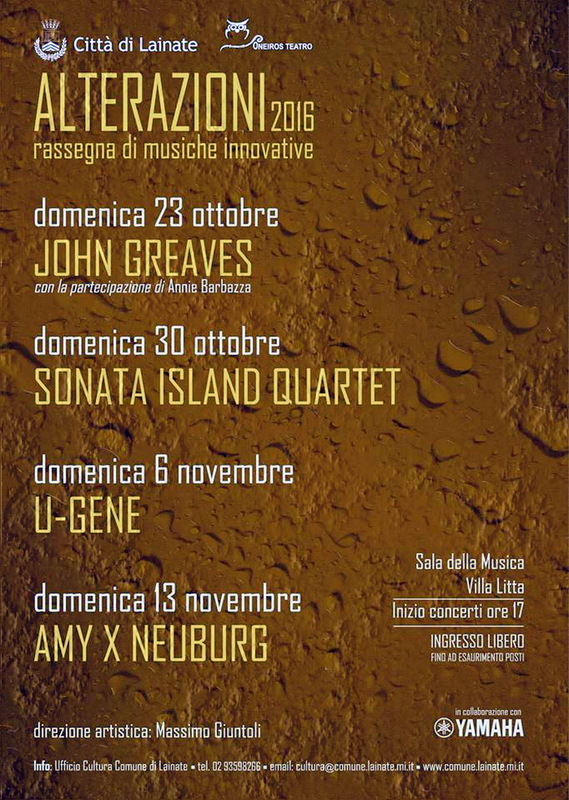 Esce a fine mese per Confront Recordings Four Quartets, album che documenta il recente incontro di Tom Jackson, Ashley John Long e Benedict Taylor con Keith Tippett, giocato su un piano artistico di dialogo e di parità al di là del rapporto allievo-maestro che ha dato il via al progetto. Le prime copie del cd sono ospitate nella confezione metallica che è divenuta nel tempo caratteristica delle produzioni dell'etichetta, ma stavolta di dimensioni più grandi, e con un piccolo omaggio all'interno. Chamber improvisation of the highest order. Tom Jackson and Keith Tippett met at Tippett’s educational sessions on free improvisation in 2001. When Ashley-John Long joined those classes in 2004 he and Tom immediately formed a duo and began performing together in 2009. After moving to London later that year Tom and Benedict Taylor began playing together regularly and together they organise CRAM records and CRAM festival. The formation of this quartet thus serves to unite several histories. Keith Tippett has been at the forefront of European jazz and improvised music for half a century and his distinctive piano sound has graced hundreds of recordings. Very much a quartet of four equal parts - there is no inherent hierarchy - just beautiful music crafted out of the air by four masterful musicians. Torna a scrivere per la gioia dei suoi lettori canterburyani Phil Howitt, autore della storica fanzine Facelift, attiva a fasi alterne per una decina d'anni tra il 1989 e il 1999. 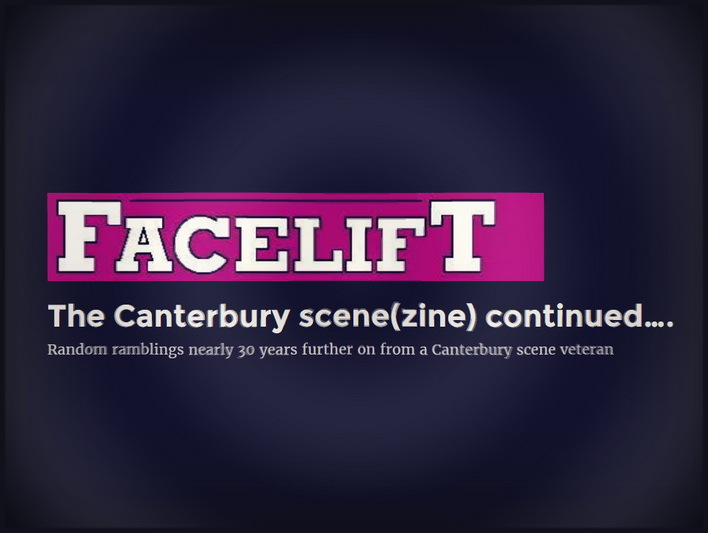 Lo fa aprendo un blog dal nome che è esplicito più di un programma: The Canterbury scene(zine) continued… ('Random ramblings nearly 30 years further on from a Canterbury scene veteran'). Bentornato Phil! 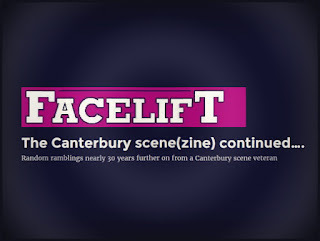 "In 1989 I started up a fanzine called Facelift - it proudly trumpetted its aim to cover the ‘Canterbury scene and beyond’. Over the years myself and other like-minded writers interviewed the likes of Daevid Allen, Hugh Hopper, Steve Hillage, Dave Stewart, Phil Miller, Gilli Smyth, Jakko M Jakszyk, Tim Blake, Pip Pyle and numerous others, whilst reviewing the studio and live work of countless musicians within the ‘scene’, whatever that may be. In 1999, a bit burnt out and embarking on a new adventure in my personal life, the fanzine fizzled out. 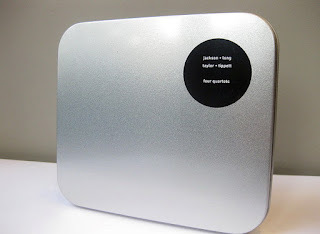 A website appeared in 2006 at http://www.faceliftmagazine.co.uk, mainly to shift some back issues of the ‘zine. It never got updated, but still exists (and you can still buy back issues there). 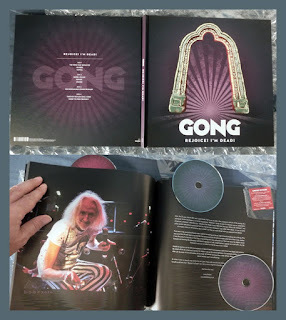 In 2016, an unscheduled visit to Kozfest, a ‘psychedelic dream’ festival in which Gong and various related bands performed, rather blew my mind and set me thinking about writing again. I’d never intended to stop Facelift, really, it’s just that running a fanzine (or indeed a website) can become very much a full-time job (and I already have one of those). Maybe a blog would be the perfect way to start rambling on again about the music that I love. These are my first written thoughts 17 years on – please let me know if you want more…!" Bella intervista di oltre un'ora a Christian Vander raccolta a Le Triton lo scorso 6 giugno: ecco perché la intitolano CV.VI.VI.MMXVI quelli de L'Inactuel, qui al loro strepitoso debutto sul web. Né en octobre 2016, L'Inactuel est un e-zine aux multiples visages, quelque part entre l'information et la création, entre l'art et le journalisme, parfois les deux. Son identité est sa pluralité, ses auteurs provenant d'horizons très différents animent le site avec leur regard singulier, leur curiosité et leur créativité. Espace de libre expression authentique, chacun est invité à se l'approprier, qu'il soit auteur ou bien lecteur. Bienvenue! E' pronto in cd e in vinile bianco trasparente - ma solo in poche centinaia di copie - l'album di Jump for Joy! Bat Pullover: lo distribuisce ReR Megacorp o direttamente da casa Yumi Hara. Del gruppo, che ha compiuto le sue prime mosse poco più di due anni fa, fanno parte oltre a lei Chris Cutler, Jean-Hervé Péron, Geoff Leigh, Geraldine Swayne e Werner Diermaier. 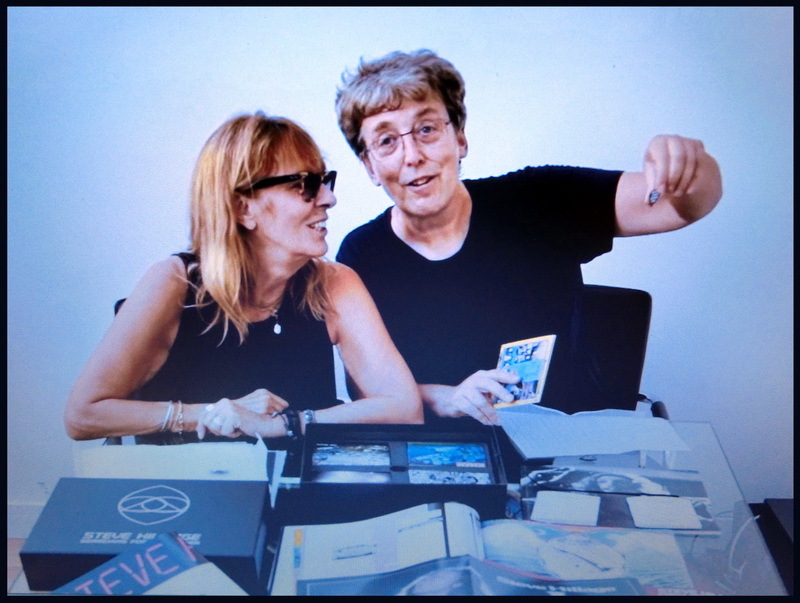 Steve Hillage e Miquette Giraudy esplorano il contenuto del megabox antologico Searching for the Spark, finalmente pronto presso Madfish. Ne esistono solo 2500 esemplari, uno dei quali contiene una specialissima sorpresa: "One lucky owner of the box set will find that Steve and Miquette included an extra message on their signed certificate. This will be that owner’s ‘golden ticket’ that entitles them to an exclusive gift from Steve: a stained glass window featuring the Sparks icon designed by hand by Richard Pelham of Glastonbury Stained Glass. The icon, otherwise known as ‘Vesica Pisces’, is formed of curves and strips of carefully cut and hand-soldered iridescent glass with a width of approximately 1cm." Peter Hammill parla a Mark Powell di Esoteric Recordings dell'ultimo - termine da prendere alla lettera, probabilmente - album dei Van der Graaf Generator, Do Not Disturb: "More or less, all for the best, in the end it’s all behind you." Erik Satie per due chitarre: buona l'idea di Peter Kraus, condivisa poi da Mark Bird e accolta dalla nuova él per Cherry Records. Nel cd c'è spazio anche per una Trois morceaux en forme de poire offerta da Gaby e Robert Casadesus e per una versione di Parade dell'Orchestre National de l’Opera de Monte Carlo guidata da Louis Fremaux. On hearing French pianist Jean-Joël Barbier’s recordings of Satie, Peter Kraus realised the possibilities of transcribing the music for the classical guitar. Peter began with the Gymnopédies and Gnossiennes for solo guitar. The greater complexity of such works as the Pièces Froids led him to transcribe for two guitars, inviting fellow Los Angeles guitarist Mark Bird to collaborate. 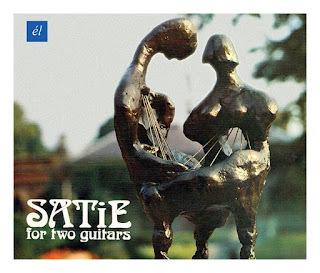 Experimentation and revision ensued with “Satie for Two Guitars” the impressive result. 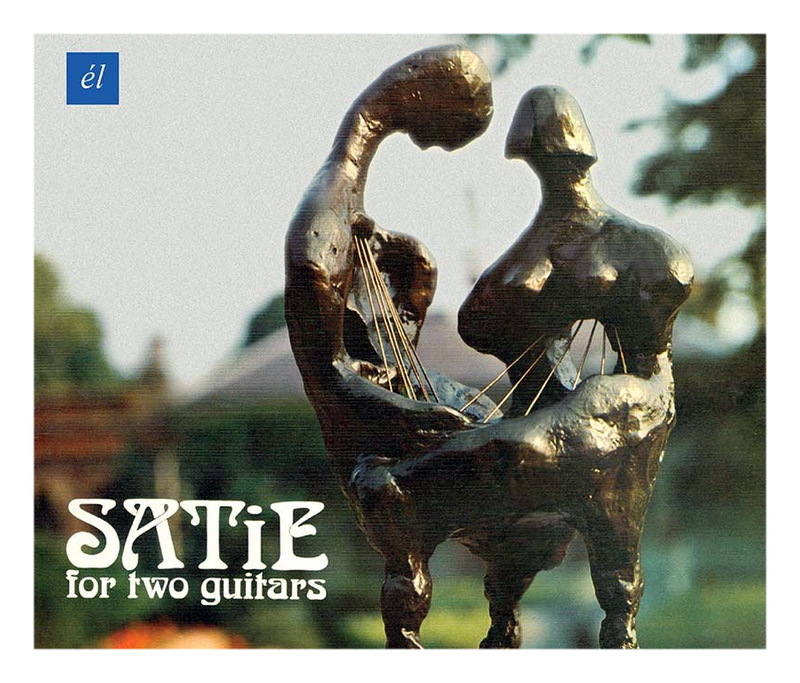 In this edition, Satie for Two Guitars is complimented by an intensely coloured, very French recording of the composer’s music for the controversial ballet Parade in a performance by the conductor Louis Fremaux with the Orchestre National de l’Opera de Monte Carlo. Parade’s scenario was written by Jean Cocteau in 1916-17 for Sergei Diaghilev’s Ballets Russes with costumes and sets designed by the then-cubist painter Pablo Picasso and choreography by Léonide Massine. The public were outraged by Satie’s score which included typewriters and a foghorn and a considerable scandal ensued culminating in a short prison sentence for the composer. The programme is completed by Gaby and Robert Casadesus’ recording of the Trois morceaux en forme de poire, Satie’s eloquent riposte to a critic who had accused him of writing formless music. La lunga attesa di un album di Massimo Giuntoli per solo pianoforte è finalmente premiata dallo splendido Piano Warps, da qualche settimana disponibile presso Bunch Records. Una meraviglia! 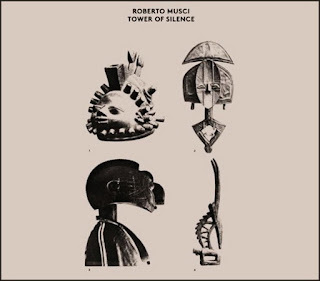 Vede la luce in questi giorni un doppio album antologico di Roberto Musci, Tower of Silence, prodotto in un'elegante edizione in vinile dall'olandese Music From Memory: "Traveling extensively across Asia and Africa between 1974-1985 to study music, Roberto made many field recordings and collected many instruments on his travels which he would then combine with synthesizers and electronics back in Italy." 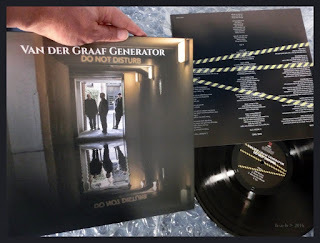 Riedizioni di lusso in vinile nero o colorato per gli storici lavori dei Camberwell Now - Meridian, The Ghost Trade e Greenfingers - per opera dell'etichetta statunitense Light in the Attic, la stessa che a inizio anno ha rivisitato il catalogo This Heat. Ci sono tutti i materiali ufficiali, un paio di brani extra, testi, foto d'epoca e nuove note di copertina: protagonisti Charles Hayward, Stephen Rickard, Trefor Goronwy, e in Greenfingers anche Maria Lamburn. Arriving in 1986, The Ghost Trade, the group’s sole full-length LP, was what existed at the confluence of live performance and studio experimentation. Similar to This Heat’s process, the group spent two years in Cold Storage experimenting with the studio and assembling finished songs from vast quantities of tapes. Their two EPs, re-issued as The EP Collection, were borne of a similar process but each with unique yields. The tracks that eventually formed The Ghost Trade were songs forged in the bleak beauty of Thatcher’s London. “To me, the sounds invoked humanity trapped behind and inside a world constructed of glass, steel, and concrete, frozen inside the textures like prisoners of the twilight zone, humanity haunting a landscape it had made for itself,” says Hayward. Uno speciale programma curato nei giorni scorsi da Okkyung Lee al Jazzhouse di Copenhagen ha visto tra i protagonisti John Butcher, Ikue Mori in duo con Steve Noble, il duo di Agustí Fernández con Lotte Anker, il duo della stessa violoncellista con David Behrman e il dinamico trio Albert Newton con John Edwards, Pat Thomas e Charles Hayward, tornato quest'ultimo in grado di affrontare le attività concertistiche. Ampia documentazione video è su YT alla pagina di Jazz Peter.